Osmosis is the term used to describe the natural migration of water from one side of a semi-permeable membrane into a solution on the other side. The phenomenon occurs when moisture from the soil passes through the membrane covering of the roots of plants, with no loss of nutrient liquid from the plant. The membrane acts as a one way barrier, allowing the passage of water but not of the nutrients dissolved in the liquid within the root. Osmotic pressure can be obtained by measuring the head of the solution when the action ceases. The semi-permeable membrane and the parchment are like filters. They allow the water molecules through but not the larger molecules of dissolved substances. The phenomenon is important not only for the absorption of water through the roots of plants but in animal and plant systems generally. Reverse osmosis is a water filtration process which makes use of semi-permeable membrane-like materials. 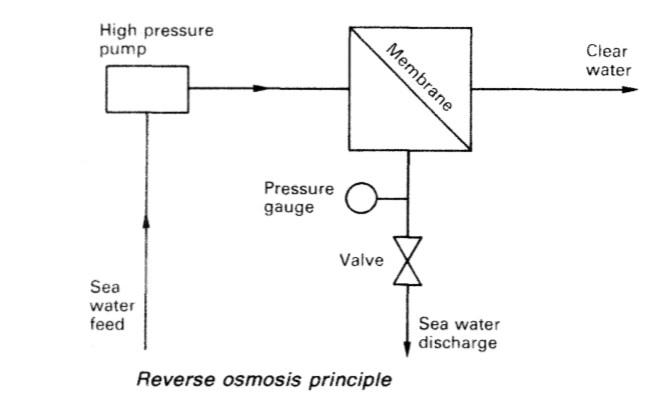 Salt (sea) water on one side of the membrane (Figure 1) is pressurized by a pump and forced against the material. Pure water passes through but the membrane is able to prevent passage of the salts. For production of large amounts of pure water, the membrane area must be large and it must be arranged in a configuration which makes it strong enough to withstand the very high pump pressure needed. The man-made membrane material used for sea-water purification is produced in the form of flimsy polyamide or poiysulphonate sheets, which without backing would not be strong enough. 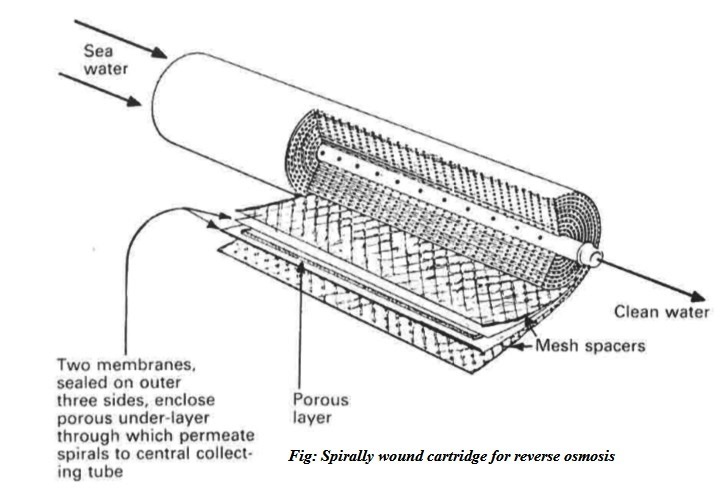 The difficulty of combining the requirements of very large area with adequate reinforcement of the thin sheets is dealt with by making up spirally wound cartridges (Figure 3). The core of the cartridge is a porous tube to which are attached the open edges of a large number of envelopes each made of two sheets of the membrane material. The envelopes, sealed together on three sides, contain a sheet of porous substance which acts as the path to the central porous tube for water which is squeezed through the membranes. The envelopes are separated by coarse gauze sheets. Assembled envelopes and separators initially have the appearance of a book opened so that the covers are in contact, the spine or binding forming a central tube. The finished cartridge is produced by rotating the actual central tube, so that envelopes and separators are wrapped around it in a spiral, to form a cylindrical shape. Cartridges with end spacers, are housed in tubes of stainless steel (Figure 2) or other material. Output of the reverse osmosis plant is governed by the number of cartridge tubes in parallel. Quality is improved by installing sets of tubes in series. One problem with any filtration system, is that deposit accumulates and gradually blocks the filter. Design of the cartridges is therefore such that the sea-water feed passes through the spiral windings and over the membrane sheets with a washing action that assists in keeping the surfaces clear of deposit. A dosing chemical, sodium hexametaphosphate, is also added to assist the action. The pump delivery pressure for a reverse osmosis system of 60 bar (900 lb/in2) calls for a robust reciprocating or gear pump. The system must be protected by a relief arrangement. Sea-water feed for reverse osmosis plant, is pretreated before being passed through. The chemical sodium hexametaphosphate is added to assist the wash through of salt deposit on the surface of the elements and the sea water is sterilized to remove bacteria which would otherwise become resident in the filter. Chlorine is reduced by the compressed carbon filter while solids are removed by the other filters. Treatment is also necessary to make the water product of reverse osmosis potable. The method is much the same as for water produced in low temperature evaporators.